A few days ago I started an experiment to test the SEO benefit of unique images. Amongst other things, I analysed the top-ranking images on Google.com and noticed that, along with alt tag and title optimisation, they all followed a similar format and style (all white backgrounds, lots of red and blue, lots of word clouds and magnifying glasses etc). 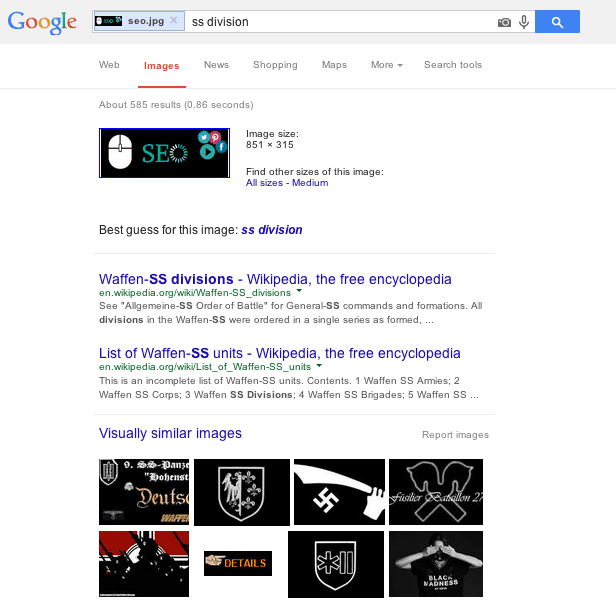 Google had decided, in its infinite wisdom, that my original SEO image was most likely concerned with the SS Division. For those of you that failed history (myself included, just caught up via Wikipedia), the SS were not just part of the Nazi party, they were the special armed part. As you can see in the above screenshot, some of the relate images include some, um, more accurate representations of the party. Why was my innocent SEO image branded by Google as reprehensible? One guess I have is that it had trouble reading the letters “S”, “E” and “O” given the dark background. Likely tip for the future: use your keywords in your alt tag, image title AND actual graphic for best results. I’d like to know more about the algorithm behind Google’s “Best guess for this image” feature. Are there other weird results like this? What’s the knock-on SEO effect for sites that choose to think outside the box when it comes to image creation? Now excuse me while I go and make some graphics of bunnies and rainbows to try and get on Google’s good side.